The Croatian motorways are actually surprisingly well maintained and overall in good condition. They are marked with a special green-white road sign similar to the European signs (motorway, autoroute, autobahn). In case no other speed limits are noted (traffic regulations, road works, weather conditions) the speed limit on the Croatian motorways is 130km/h (81 mp/h) with a legal tolerance of 10% on speeds over a 100 km/h (60mp/h). The motorways consist of two traffic lanes and an emergency stopping lane in each direction with many rest areas, gas stations, restaurants and panoramic points. Note: You might hear the term "highway" from many Croatians. It is how some of us freely translate the motorway / free-way term from Croatian ("autocesta") so don't get confused. The "Autocesta A1" also known as the "Dalmatina" with its 480,7 km is the longest motorway in Croatia and a part of the planned Adriatic - Ionian motorway ( It connects the capital of Zagreb with Split and continues further south towards Dubrovnik. Currently, due to the lack of finances and the fact that we are waiting for Bosnia and Hercegovina to complete its motorway which should eventually connect the coast of Croatia with Slavonia (connection with Hungary, Serbia..) the motorway A1 ends in Ploce (100km from Dubrovnik). This motorway runs near a number of major Croatian cities, national parks, world heritage sites, nature parks as well as resorts which makes it of national significance due to its impact on our tourism. 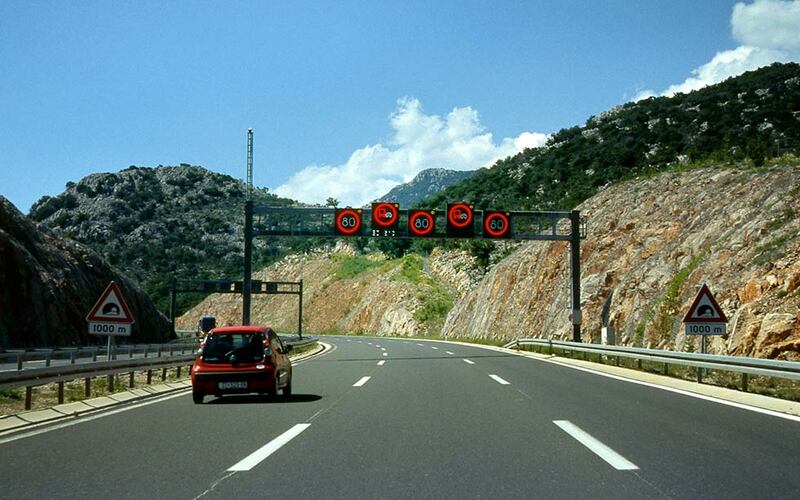 The A1 section of the motorway under Velebit mountain is characterized by very unfavourable weather conditions (wind gusts) especially in the winter, leading to cases of temporary closure of specific sections of the A1 motorway, of which the most frequent are Sveti Rok - Maslenica - Posedarje. A2, also known as the "Zagorska autocesta" connects Zagreb with the Macelj border crossing (into Slovenia, continuing to Austria) and is a part of the Pan-European corridor. The motorway follows a route trough the Hrvatsko Zagorje region, bypassing Krapina, Zabok, Zapresic and Trakoscan. With the construction of this motorway a long roundtrip via Ljubljana has been avoided. The road is frequently maintained due to a considerable volume of traffic throughout the whole year so you might run into some road works. The 306 km of the A3 motorway represent a major east-west transportation corridor connecting Zagreb with Slavonia and its cities along the Sava river, continuing further on into Serbia. It serves as a route connecting the European Union states and the Balkans as part of another Pan-European corridor. This motorway was originally designed in the late 1940s with its construction beginning a few years later. An interesting fact is that a substantial portion of the work was carried out by youth from Yugoslavia and abroad through youth work actions. Nearly 300,000 youth, including Yugoslav army soldiers, took part in the construction of the "Brotherhood and Unity Highway"
As the route spans itself over a hilly terrain, it is being regularly maintained so you might run into some road works. Also known as the A5 motorway or "Slavonika", it is a 56 km long connection from Hunary via Osijek towards Bosnia & Hercegovina (eventually connecting to the A1 via B&H). At the moment its significance is not yet in fully glory as the original idea is connecting Eastern Europe with the Adriatic making it the fastest way to the sea. The A6 connects Zagreb with the seaport of Rijeka, running past a number of cities, provides access to Risnjak National Park and indirectly to numerous resorts, notably in the Istria and Kvarner Gulf regions. It has a positive impact on Croatia's economy (trading routes from Rijeka / tourism). As the A6 motorway route runs through mountainous terrain of Gorski Kotar, it has quite a number of major structures such as bridges, viaducts, tunnels, underpasses, flyovers, and culverts. The A7 motorway, also known as "Kvarnerska autocesta" starts at the border with Slovenia and heads south towards Rijeka, interchanges with the A6 and continues to the Krk island bridge. It is significant due to its contribution to Croatia's tourism - it represents the shortest and the most convenient route between Trieste (Italy) or Ljubljana (Slovenia)and the Adriatic Sea. Possible traffic jams when entering/exiting the country in July and August (especially on weekends). The Istrian Y is a motorway complex combining the A8 and A9 motorway spanning throughout the Istrian peninsula. Both motorways meet at the Kanfanar interchange in south central Istria. The A8 starts in Matulji (near Rijeka), pases the Ucka tunel and Pazin ending at Kanfanar, while the A9 heads down to Vodnjan and Pula or up north towards the Umag interchange. Noting special, just a bit of traffic during the summer. Depending on a vehicle type, it is designated to its own category which servers as a base for a price calculation. Pricelists are located next to each motorway. In Croatia, in the period from 15.11. until 15.04. it is mandatory to have winter equipment on the following motorways: A1 (from Maslenica towards Zagreb and vice versa), A2, A3, A4, A5 and A6. Having winter equipment (for vehicles up to 3,5tons) means having winter tires ( or M + S) on all wheels or summer tires with a minimum tread depth of 4 mm and snow chains standby in case they're needed. Drivers caught driving without the appropriate equipment will be fined and excluded from traffic. Studded tyres are prohibited.